The LMD-1530W is an entry-level HD monitor that offers the best quality-per-cost balance for entry level applications such as HDV monitoring. The LMD-1530W can accept HD signals via its HDMI or analog component standard connectors. 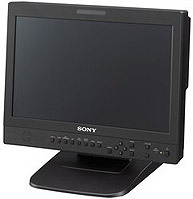 The monitor provides user-friendly features proven in Sony professional monitors for convenient monitoring in wedding and event videography, and many other applications. The LMD-1530W comes equipped with a full range of analog SD inputs including analog composite NTSC and PAL, Y/C (S-Video), and 525i/625i component and RGB. Additionally, SD-SDI input can be achieved by using the optional BKM-320D SD-SDI input adaptor. Furthermore, the LMD-1530W offers an HD signal input capability via its standard HDMI and Analog Component interface. Comes equipped with high-purity RGB Color filters, allowing the reproduction of colors with stunning depth and saturation. The LMD-1530W provides high-brightness, high-contrast images thanks to wide aperture LCD panels. In addition, the use of precisely manufactured RGB color filters allows these monitors to reproduce colors with stunning depth and saturation – creating highly natural images. This monitor can display various area markers, including a center marker and aspect markers. The brightness of these markers can be selected from three different levels: white, gray and dark gray. Users can also select a black or gray matte to fill the outer area of the aspect markers. Users can select from high, low or preset color temperatures. A variety of gamma modes can also be selected. With the LMD-1530W monitor, the scan size can be selected from 5% over-scan and -3% under-scan modes. The aspect ratio can be switched between 16:9 and 4:3 according to the input signal.